Hi everyone, this may have been covered elsewhere but sorry Im not the best at finding things on forums. 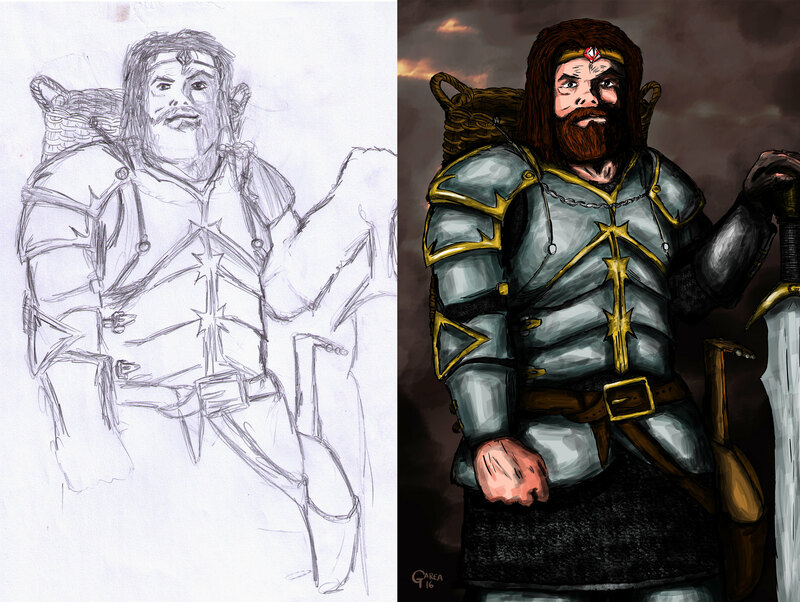 Im just wondering how everyone here gets from initial idea to finished images. 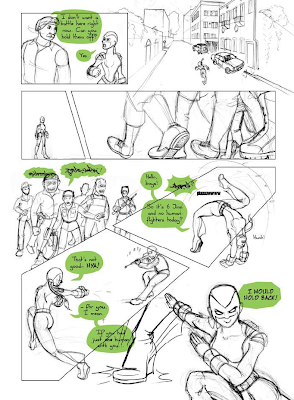 I went on a comic hunt and found some great stuff from folks here and I came across a really cool image of how the artist of Chirault (that comic looks amazing by the way) begins drawing a full page with paneling (is it Varethane?). Anyway, I dont have any panel work here but just basic pictures before and after. I usually just use pencil and paper, scan into pc, and ink/colour in photoshop CC using a drawing tablet. I used to not have a tablet and used illustrator and the pen tool but the line art took aaaaaaages! I can post the progress gifs that I've saved over the years. Before anything else, I write down the scene and dialogues. The horrible handwriting means I am trying to catch up with my ideas as they hurl themselves on the paper! Since I’m the only member on this team, presentation doesn’t matter: I didn’t even bother describing the panels here, only the dialogue. If I have a brilliant idea I’m afraid I’ll forget, I do write a description, and even make thumbnail sketches of what I see in my mind’s eye. When a team is involved, the writers put much more presentation work into this step, describing the most important elements of each panel, their “camera angle”, even the atmosphere and attitudes they need the artist(s) to pull off. Anyone who is then handed such a script would know exactly what to do. Several weeks may elapse before it’s time for me to draw a scene after I’ve scripted it. This gives me a fresh outlook on it and I often rewrite it or the dialogues. I divide the text where I feel a page should end and a new one begin. A page should always end in a logical pause or a cliffhanger, especially when it’s the right-hand page. For scenes that require an extra oomph, a spread (2 facing pages) can be planned as a single unit (known as a splash page). What this all means is that the left- or right-hand position of a page is also an important decision, which I have to make at this stage, because I may have to expand or shorten parts of the synopsis to make pages fall where I want them to. I then use brackets to break down each page further, into what will be the panels. This is also a matter of feel and depends on the mood and tempo of the scene. For instance, if a question is asked by a character and answered by another in the same panel, you have a regular conversation. But if the answer comes in the next panel, a pause is implied – the second character was slow to respond. These are very subtle details, but they are the key to storytelling. My brackets also help me see at a glance if I have too many or too few panels on my page. The European format I use would theoretically allow me up to 12 panels, but it’s a good idea not to go to that extreme unless some of them are really tiny. I’ve seen pages in American comics with one single panel, but I feel they are weak unless used only for exceptional scenes. I keep to something between 8 and 10 for average pages, spread on 4 rows. Naturally, I break out of that partially or completely as the story dynamics require. This is the birth of the comic proper. Sometimes I know exactly how the page should flow, others I have to sweat for a long time until I can decide on how to sequence the story. Most of the time it’s somewhere in between – there are specific moments I want on the page, and the rest needs to be worked around them, bulding up to them or otherwise giving them the spotlight. In this example (p14 in vol.2), the page culminates in its last panel, where both the character and the tension are fully charge and ready to explode. I can already see that I’ll want to make it larger in the final layout. This is where the magic of the panels is wrought, each individually and all together as a composition. Many things have to be considered: pace, legibility (leading the eyes through the panels in the correct order), variety (in the sizes and proportions of the panels but also in the “camera angles”), energy (a page can be serene, speedy, explosive, overbearing...) relation to the previous and next page, etc. I also scribble the dialogues in to see how much room I should expect the text to take up. It usually takes more than one attempt to finalize the sequence. The first draft is mostly for me to get a general idea of what I can do and whether I have a good number of panels. If there are too many, I shift some over to the next, looking for another point where I can logically break the flow. If that’s not possible I may simply eliminate some. Inversely, if the page is too empty, I may bring panels over or insert some. Such changes must be done without weakening the elements mentioned above in this page or the next, so they come with much hair pulling. Some comickers prepare their sequencing very carefully, down to the study of light in each panel. It’s a smart thing to do when you’re going to draw and ink it on paper, where there’s little room for mistakes and fixing them. Personally I just capture the essential elements in each panel at this point, because I proceed differently and don’t have to commit to the layout yet. This is where my work process gets really unconventional. operation). I then transferred my final lines, using tracing paper, to a sheet of watercolor paper where I had prepared a clean layout of the panels. I inked it with much trepidation (mistakes were not redeemable) and then erased the pencil lines. Finally I colored it using artist’s ink. It’s a method that has its advantages, but on the whole it was constraining, time-consuming, and forced me to take irrevocable decisions early on in the process. 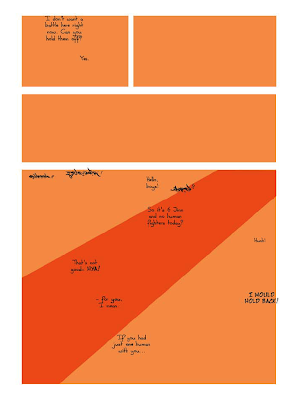 a large panel that is exactly half the page’s height or width, as that’s a bit like having your horizon line in the middle. I also input the text in its actual font and size, to make sure it doesn’t take an unexpected amount of space. It’s often necessary to rewrite it more concisely or resize panels to leave room for the illustration. I highly recommend doing this now, not after the page is drawn – surprisingly, mainstream comics often leave the text for the very end, and you can tell it’s been pasted on. It should be integrated to the composition, not added as an afterthought. It should also be kept to a minimum, or you will create a conflict between the flow of the images and the stops created by the text. The more dynamic a page, the less the eye should be forced to stop and read. As much as possible, I show instead of telling. Knowing all this, I toy with the panels’ sizes and positioning until I like the balance and movement of the whole. 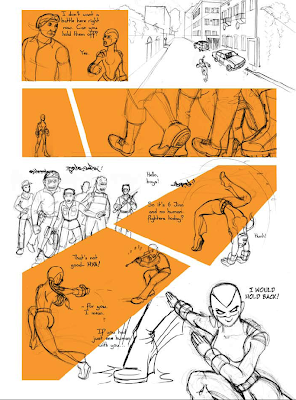 This page showed a passage from normal narrative to an action sequence, expressed by the diagonal slash across the second half, which also frames dramatically the final panel in a triangle – although this will all need to be finetuned when the pencils are added. energy of the illustration, the last thing I want to do is break my momentum by worrying about borders. This is the main reason why I dropped the traditional way of penciling a page. I can use the entire sketchbook page if drawing something particularly dynamic, but I do have to be careful: things that will be very small on the page need to be drawn small. This is because detailing changes with the scale, and if I draw something way much larger than it will end up, I may put in too many details – and then while inking I’ll have to improvise the simplification. It’s better to be aware of this right now. When I’m out of sorts or not properly “tuned in”, my drawing is unmistakeably flatter, my characters stiffer. When that happens, even if I’ve put much work into a pencil, I’ll drop it and do it again, until I capture the life I wanted in it. These pages are going to be around for many years, so it’s worth putting in the extra effort. When I’m sure I don’t want to make anymore changes, I flatten all the pencils on a single layer, load all my shapes as a selection and stroke them on their own transparent layer. I can now add my speech bubbles. I could equally well do this after inking, but you never know if something unexpected comes out of their placement. I use the Pen tool and draw the circular shapes first, adding the “mouthpiece” afterwards. This way the shape keeps its consistency. breaking the grid, share a side with it, or create an opening in the frame where it is tangent to it, so that the white of the bubble and that of the gutter are connected (I use this frequently in other pages). They can be stroked with a varying width for extra dimensionality. That’s not even going into the expressive potential of the bubble, where one can get super creative –just keep in mind that making them legible is the priority. On this page alone there are 4 different bubble shapes: the default “broken ellipsis” I use, the Jinns’ rough speech, the “burst” bubble that signals shouting, and in the last panel, a more angular one meant to show a change for the harder in her tone of voice. Note that I keep them as compact as possible, and they are carefully placed to contribute to meaning and to directing the eye properly. You don’t want something to be read before an action when it’s supposed to follow it, or vice-versa. Their placement must also be aesthetic in relation to the frames and characters. The rule that goes for the placement of drawn elements also goes for speech bubbles: tangents and near-tangents must be avoided, and replaced by slipping one element behind the other (panel 1) or moving them further apart (panel 7). Presently I load the bubbles as a selection and stroke them, as well, on their own layer. I don’t ink digitally. I need the same physical freedom to ink as I do to sketch, so I print out the whole page (over 2 or 3 A4 sheets, since it’s A3-sized) and tape it to my work surface. Over it I tape a single sheet of tracing paper, and set to work using Faber Castell Ecco Pigment ink pens. They are my favorite because their tip is closer to felt than plastic, making the inking an almost sensual experience and allowing for less mechanical lines. Why, you might ask, don’t I just ink over the pencils and scan that in once and for all, instead of printing them out again? The reason is consistency. My pencils are all over the place and not proportional to each other. Some will have to be shrunk to 20% of their size on the final page, others will be enlarged. If I inked them first, then scaled them haphazardly, the line width would be widely inconsistent throughout the page. The amount of detailing would be equally inconsistent: a tiny figure could end up more detailed than a larger one. Since the page has to work as a single composition, it must also be inked as a single composition. My way ensures harmony of the whole, which will eventually shrink quite gracefully onto paper. Then I go back over everything, introducing variation in the line width (compare the page below with the above). There’s more than one way of doing this. I learned to thicken lines where there is tension, especially in a body in action; others do this where there should be shade. I do a little of both: my concern is for it to look good and dimensional, and to lead the eye where it should be. I don’t use the Pen tool and Stroke Path method (if you don't know what that is, ask me below) because good lines require a knowing eye, not a computer’s blind execution of a command. I scan my tracing paper, again in several parts, and knock out the white background. I can then place it neatly over the pencil, delete that layer, and then retouch where necessary. Some portions of frames or bubbles have to be deleted. Once I’ve made sure the lineart is perfect, I merge the lineart, frames and bubbles into a single layer. I need to do this to make coloring as hassle-free as possible. layer. I created a Photoshop action so I can do this without repeating useless clicks endlessly. 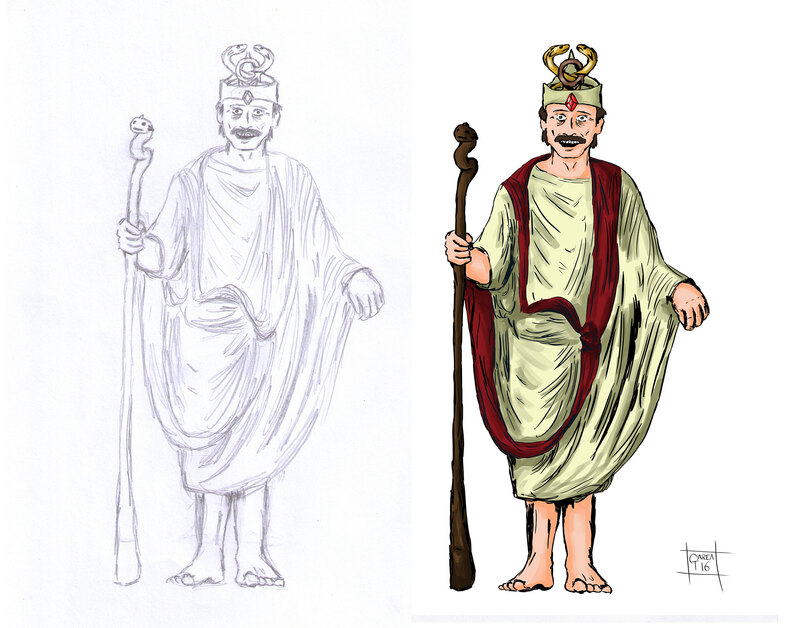 The digital coloring process is fundamentally different from coloring on paper in that you need all your lines to close neatly, in order to be able ot select and fill a color surface. On paper, you can have your lines as loose as you want and it won’t affect ow you color them later. On screen, loose lines mean a lot more work. I believe this technical detail has defined the graphic style that dominates mainstream comics today. Textures: A few touches of texture add visual interest to the page, and makes up for the simplicity of the lines. A recurring example in this comic is my use of manipulated photos as backgrounds (not in this page though). In order to integrate them to the illustration, I reduce them to greyscale, increase the contrast, and colorize them with the Brush tool – the limited palette makes them blend in better with the rest of the page. The texture in the dark margins here actually is a photo, but used as an abstract, indistinct, “something-there” that is much more dramatic than a flat hue. Other textures, such as the brickwork in a wall, can be photographic, or they can be created using Photoshop brushes (like the flowery bush in the second panel, to the left). The simplest texture to create, but which is enough to add depth when used smartly, is the gradient fill. I use it frequently where I don’t want a background but a flat color is just too flat. I’m not sure if this is an industry term, but this is how I refer to the final steps of applying shading and highlights, and special effects if applicable. I use cel shading, meaning hard-edged shading, because it’s so much faster to work with, and my style is simple enough to agree with it. I have brought up the time factor before, but it’s essential to accept the fact I can’t spend forever on each page, and look for ways to work quickly that won’t look rushed. So with a hard brush, I paint in the shadows directly, on a separate layer which is set to Multiply. The opacity varies between 40 and 60%, depending on how harsh I want the shadows on that page. In general, I paint each shadow in the color of the area I am shading. It’s another quick fix but the result is very pleasing. For night scenes however I use a single dark blue, as the little shadow there is there would have to look flatter. There’s much room for experimenting and I’m learning as I go. I always use soft brushes for highlights though. It just looks too cartoonish if they are hard edged. Special effects, like textures, can be created using simple brushes. I don’t use premade Photoshop brushes – the most useful are those that are most versatile. There are less than 10 brushes I use for everything. Tweaking the brush presets, flow and opacity gives me all the range I need. Other small elements that may be added at this stage are sound effects, speed lines, bursts, blurs... The more action, the longer the list! Quieter scenes are as much a breather for the reader as they are for the character – they certainly are for me! The complete process, uninterrupted, would take 2 or 3 full work days, but it usually spreads over 2 or 3 weeks. My workflow is probably one of the least professional out here! LOL... but hey it works for me. I tend to be very loose in my planning, rarely do I have a specific panel flow in mind, so often I sketch on paper and scan in. As I ink in photoshop I tend to rearrange, move, resize panels as I go. Then I will frame the images to convey the emotion/impact I want. Once basic inks are finished I start flatting the image with the colors for foregrounds. The next thing I do is add any FX to the page (hair texture, eye highlights etc). I follow that up (and it may not relect in this set of images) with duplicating the layer and using a multiply method to shade the foregrounds. With foregrounds finished I then do the same process on the backgrounds. The last thing I do is work on dialogue. I used to not have a tablet and used illustrator and the pen tool but the line art took aaaaaaages! As for my process, I always start with script. 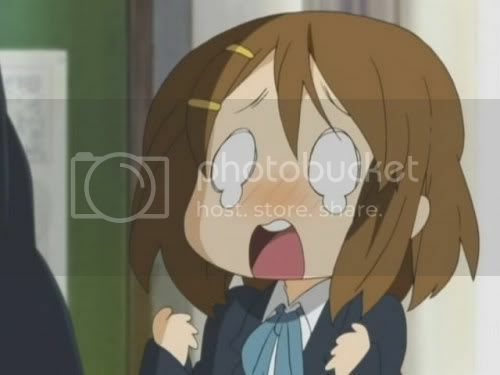 I wrote the first several chapters of the script before ever starting on pages- I script several chapters ahead, and have pretty detailed outlines for stuff that isn't fully scripted. I have a pretty simple format for scripting: just character's first initial, and then lines spoken. Extra paragraphs between dialog boxes describing actions, shot composition ideas, posing, etc. I script a whole chapter, then break it up into smaller pieces by figuring out in my head how much would fit on a page (this usually gets adjusted in the thumbnail phase). As an example, I'm gonna use a recent page. Here's the script version. After that comes thumbnails, sketching, inking, and etc. Threw together a quick progress gif- the order isn't entirely acccurate, since I just turned layers on and off instead of taking screencaps as I worked, but it's close. But general order is: Script, thumbnails, lettering, panels, sketch, ink, base colors, shading, and then THROWING EFFECTS LAYERS AT IT until it looks nice. I have a very clean, very sensible way of doing things, lol. But hey, it works! Oh, I'd love to share my method! It's... pretty simple, actually. When winter break kicks up, I'll be churning out one heck of a buffer! Personally, I theorize a scene in my head, and turn it over and over until I know exactly what it's like. Then, instead of doing a script, I do a storyboard on little pieces of paper that I cut up and staple together into a tiny, 12-page notebook! 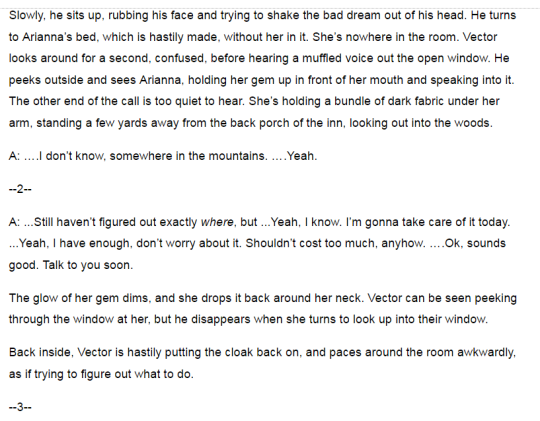 That becomes a scene 'script' since I actually write in the dialogue. From there, for each page, I'll take a big ol' piece of paper, fold down the corners so it's the right size (12x9 becomes 12x7.5, to equate (if by an inches:pixels factor of 133.4) to 1600x1000. 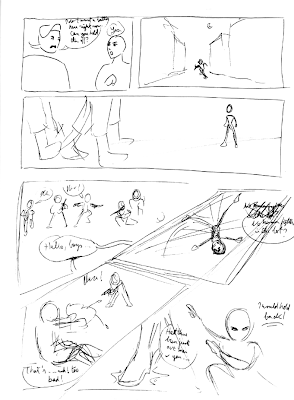 I'll then fold that up in half, to reflect the lines I draw across my storyboard so I can be more accurate, and I draw out an approximation of what I now want the page to look like (it can change a lot!). Sketch, ink, done - I don't worry too much if it doesn't look great, 'cause it's not supposed to be perfect. I use that to get feedback from my beta group (which is IRL), and then I take a picture, scale and transform it to a 1600x1000 rectangle, and get to drawing! Inks come first - I never have to edit proportions too much, just facial details, and I can freehand what I need to do pretty well. Then come the flats, which I pull from palettes (I save the flat image for reference for the colors in the next pages, too - gotta preserve the scenery colors!). 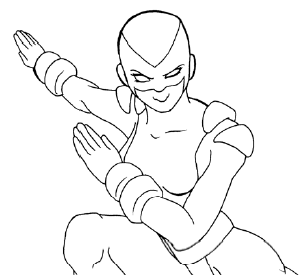 Once that's squared away (UHU UHU), I do an overshading in the same color as the lineart (which won't always be black! it is right now for a very specific reason! ), intentionally messy and a little ragged looking to give the comic a haphazard, emotionally detached and incomplete feeling. I'll sometimes do a gradient in Grain Merge ("Similar to addition, the colors of the upper layer are added to the colors, and then 50% grey is subtracted.") over that to make the light or shadows a little starker, but not frequently. The way I see my art evolving as I go along is that once I'm comfortable with the lineart shading, it'll start to develop textures, and my scenery will become more complex, with a stronger focus on intricate body language once I get a better hold on that. Then I'll start to play with how I do the shading more, so it'll move slowly away from cel shading to a more layered soft cel shading. My handwriting will also get neater... But that's in the future! And all things considered, I'm very proud of my process now. 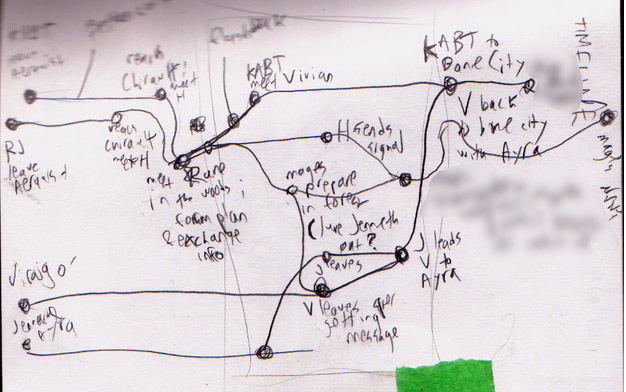 Then I script, usually with the outlines open in front of me for easy reference. This can turn into a lot of paper. ....OH I nearly forgot! I also have some videos up on my YouTube channel with recordings of me inking and toning pages. Yes Varethane I think it was on your tumblr. Ive just joined here and am trying to get to know the comics in the community. Honestly I am absolutely blown away by how amazing they are. I am trying to sort something that makes sense for me going forward in terms of my own stuff so finding that was a great step just to get my head around setting up a system. hahaha! You should see my layered mess; shading on line layers, nothing labelled ie: Layer 47 - 'what the hell is on that one again?'. instead of doing a script, I do a storyboard on little pieces of paper that I cut up and staple together into a tiny, 12-page notebook! well the pages look amazing Starfish so its def working. ...And Malaak thanks so much for the super detailed description! It helps me by breaking it into steps (I know its from your blog but still thanks for posting it!). Im gonna huddle over the PC in the holidays and read lots of everyones comics now! @starfish and @bitsfair Those gifs are awesome! Thanks for posting them! Love seeing others' process. 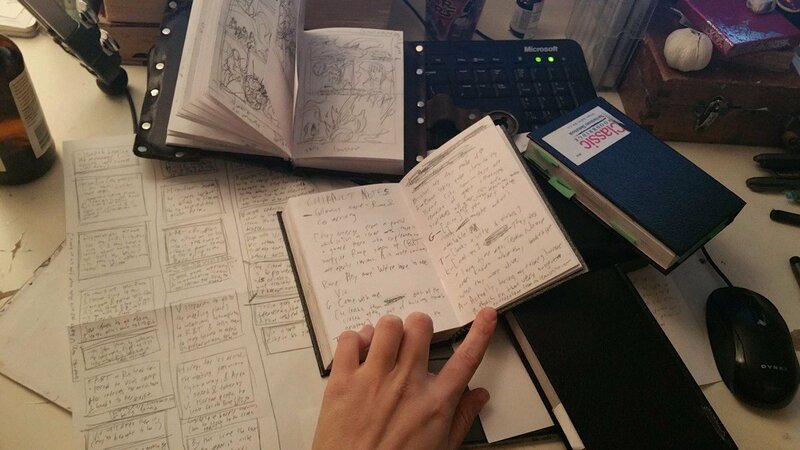 I was sometimes asked how I create my comics, so I wrote a two-part post on my Tumblr about my process. 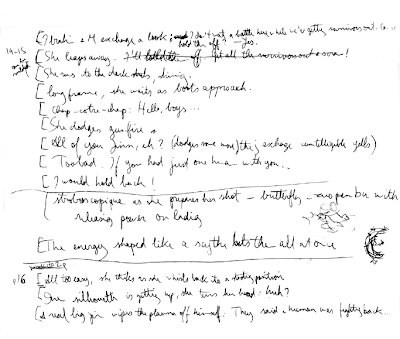 Here's part 1, which covers writing, sketching, inking. Part 2 covers what I do after scanning, such as letters and coloring. Hopefully this is of some use!